I decided to take my road bike on a rail trail in Pennsylvania today. It would have been a more enjoyable ride had the trail been paved. As it was, narrow tires and crushed stone don’t go so well together. To give myself a break, I hopped on the road and ended up riding some pretty rolling hills. The road I was on was heavily traveled by dump trucks. I was very impressed that they were cyclist friendly. They didn’t blow by me, and they gave me plenty of space, considering the shoulder was basically nonexistent. I would like to give kudos to one such driver. As I was climbing up a hill (felt like a mountain! ), I watched a mama deer cross the road. I kept watch, knowing there would be another deer to follow. Well, there was… a fawn. The only problem was the dump truck approaching from behind me. I signaled to him, and he slowed way down, allowing that little fawn safe passage across the road. I am delighted to report a happy ending for all involved. The experience made my so- so ride much better! One of my coworkers got me back on the bike (the pedal kind!) again. I moaned, groaned, and complained about it at the time, but I am backed to being hooked! Cycling doesn’t bother my knee like running did – thank goodness – but now I’m looking at new frames, wheels, etc. and oh don’t they cost a lot of money!! This past Monday we biked 22 miles on a rail trail (it needed to be flat since I was having gear issues in my cog). I had a blast! The weather was beautiful in addition to the company. It felt so good to get off the bike after we were finished – I felt like I got a good workout – it was very refreshing!! Quite an accomplishment since it has been awhile that I have ridden that kind of distance. After the ride, we dropped my aging Cannondale off at the bike shop for an overhaul ( much-needed, mind you). We also hit Starbucks for a much deserved Mocha Coconut Frap! YUM!! She also mentioned a new biking magazine she recently stumbled upon. It is titled Paved. I picked up the most recent issue yesterday, and I love it! The photography alone is ah-may-zing!! I am so stoked for our ride this Friday (well, and our trip to the bike shop tomorrow after work – you should see the list!). 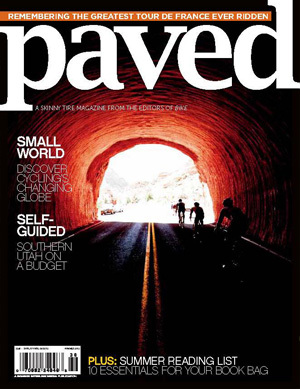 Paved magazine can be found at http://www.pavedmag.com/# I recommend you check it out!